So you think you can make a DIY wine rack? It’s important that wine is stored properly so that it can develop a great taste and flavor that wine lovers love to relish. If you have three or more bottles of wine and you would want to add more to your collection, then you certainly need to use a wine rack. 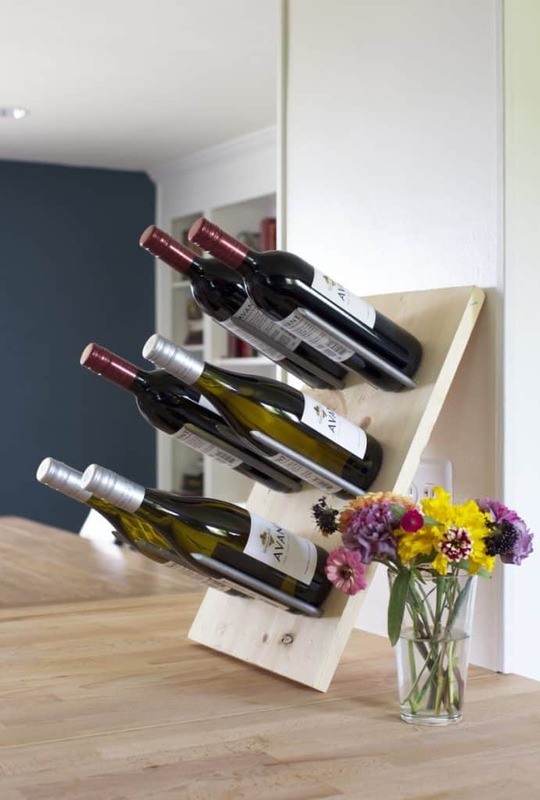 A do-it-yourself wine rack is a great weekend project that you can do by yourself or with a partner. There are so many different kinds of wine racks. They can be made from all sorts of materials. 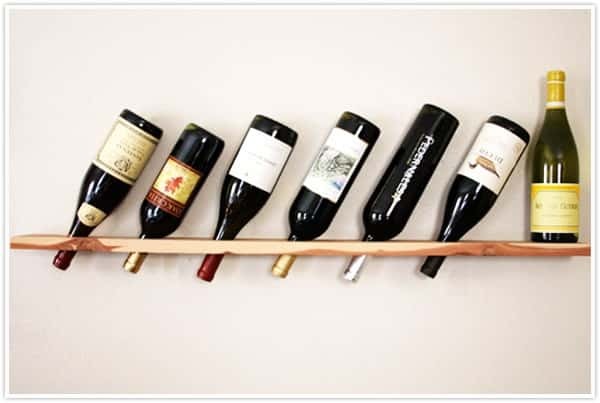 You can actually make a wine rack few designs on your own. Here are a few suggestions that will get you thinking. A PVC wine rack is by far the easiest type to make and you can get them looking very modern as well. 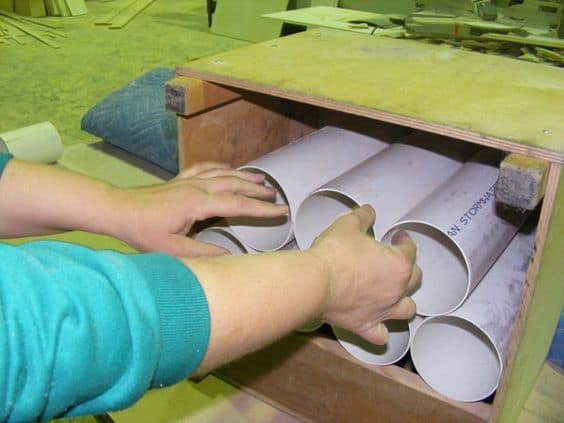 Drainage pipes made of PVC have the perfect diameter to house wine bottles. 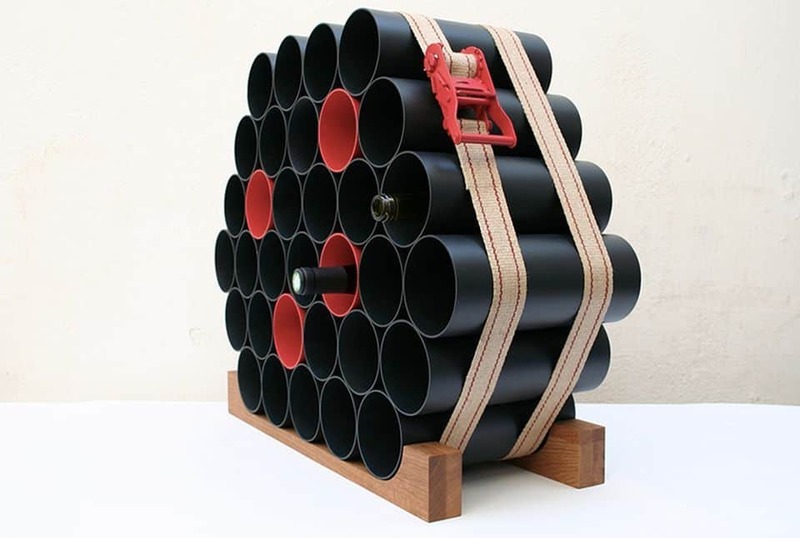 You can easily make a modular PVC pipe wine rack by stacking pipes of the same length and diameter. 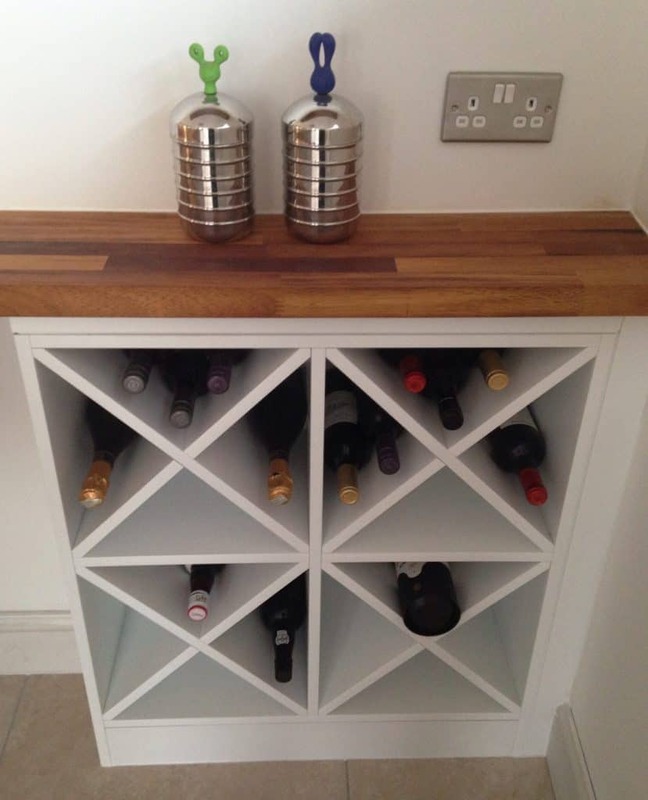 You can construct a wine rack that will house unlimited bottles of wine! Buy some 4″ drainage pipes either 8 or 10 feet long. Then cut the pipe into 1′ length sections to hold the wine bottles. Now stack and stick them together using a strong adhesive like Construction Glue. Use a wooden frame, metal frame, or even a tie-down strap to keep the whole rack together. 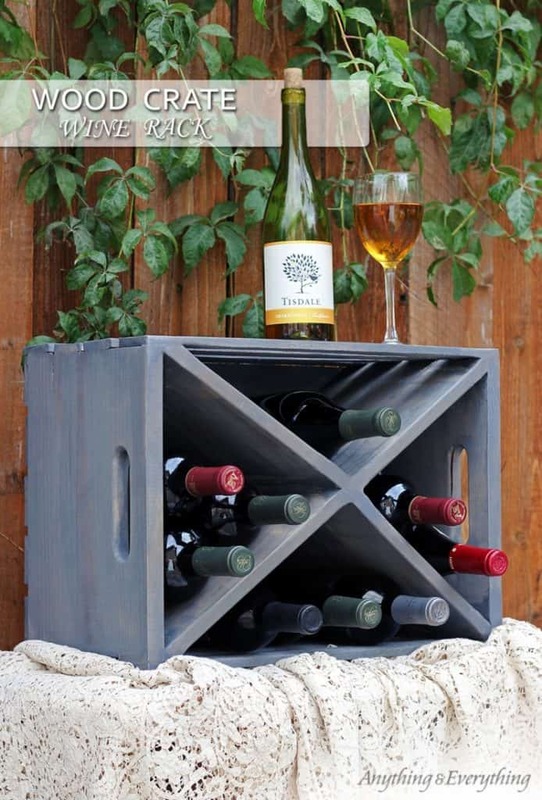 Optionally you can paint this DIY wine rack your favorite color. Now your wine collection is safe and sound. You can create more and more and more PVC wine racks when it’s time to add more bottles to your collection. This one by HomeCrux, doesn’t even require glue. You just need some ratchet tie-down straps and you’re all set. 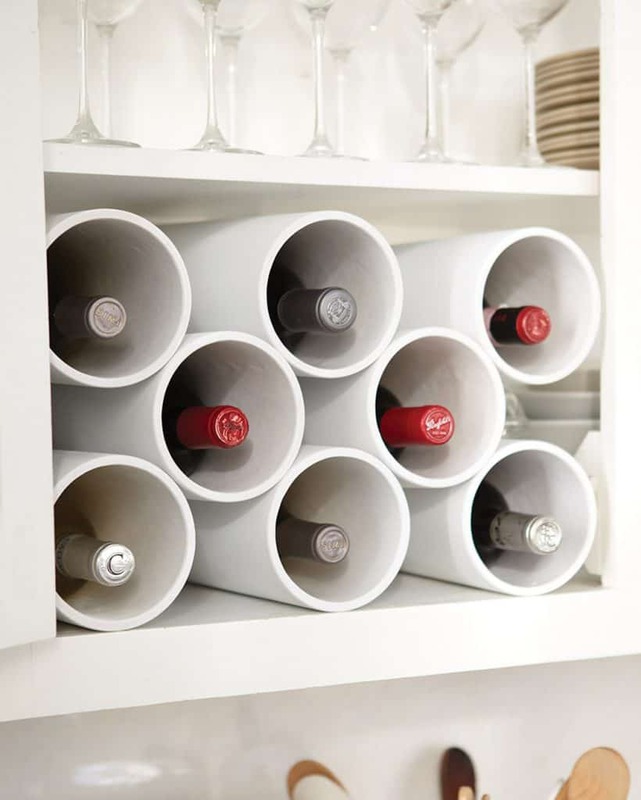 The wonderful Martha Stewart has a very simple 4-step plan for creating this really easy PVC Pipe wine rack. This Store And Stack Wine Rack by Lowes features plans for a built-in PVC wine storage rack. This is probably one of of the harder ones to make due to all the wood construction needed for the cabinet enclosure. This one is made from PVC pipe scraps. As you can see, it’s really easy to build. Here is a great idea for an X-shaped wine rack. 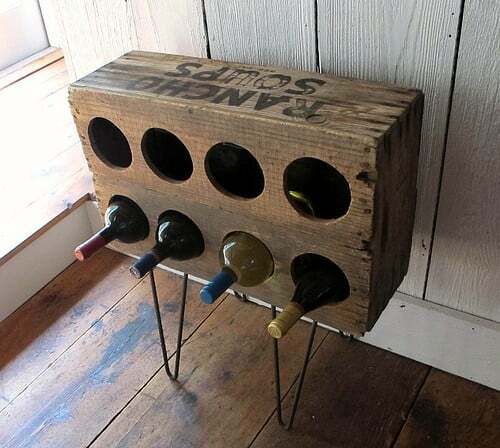 This wine rack is made from simple, discarded materials like spare wooden planks and some nails. The whole idea is to create a rack from two large wooden planks, criss-crossing them together to form a large three – dimensional letter X. The X-Shaped wine rack houses 4 sections of wine bottles and is fully expandable. 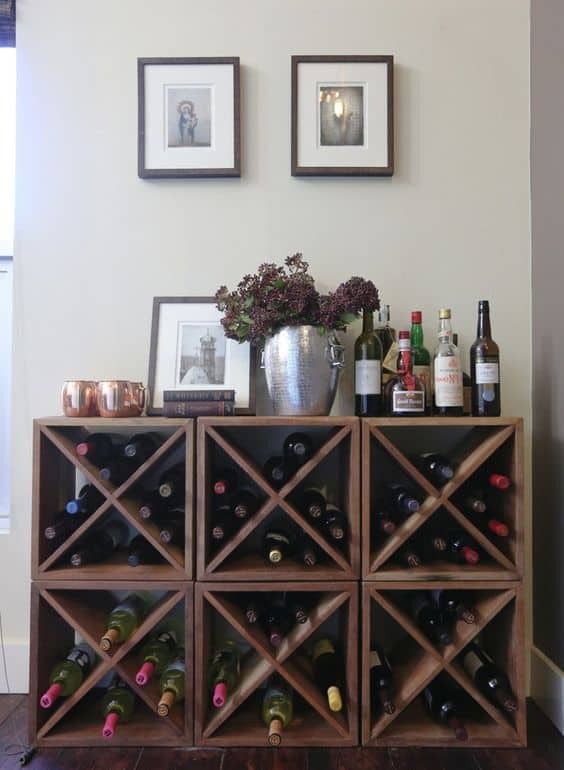 You can create three, four or more wine racks in this manner and you will never have to worry about storing your expensive wine collection again! Over at Anything & Everything, they have a Wood Crate Wine Rack which features a nice walk though of this X-style wine rack. Angie’s Roost has a similar x-shape concept. Wood has a rustic charm. It is also strong and can last a lifetime if cared for properly. It can be very easy to make a wood wine rack and I have a number of easy ideas for you. I know I said PVC was really easy, but with wood, you can make some really simple wine racks just by drilling a few holes in a board. A Riddling Wine Rack is one where the bottles are held by their necks. The necks held at a slight angle so the corks remain wet. This helps wine keep longer. Here are instructions for making your own Riddling Wine Rack. Another style Riddling board rack, is a totally inverted rack. The bottles are stored upside down with a small hold holding the neck. Here is a great tutorial for building this Wood Plank Wine Rack. 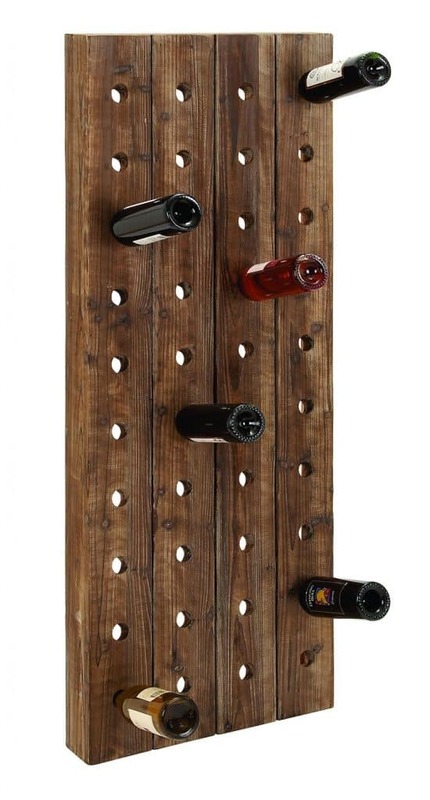 Yet another easy wine rack to build is a Peg Board style wine rack. The folks over a Shelterness out together a really easy tutorial for assembling this great looking Peg Board style wine rack. I love this Wood Crate Wine Rack over at maya made. This one is made from an old crate found in a barn. They added some wire legs and wolla, we have a great rustic wine rack! 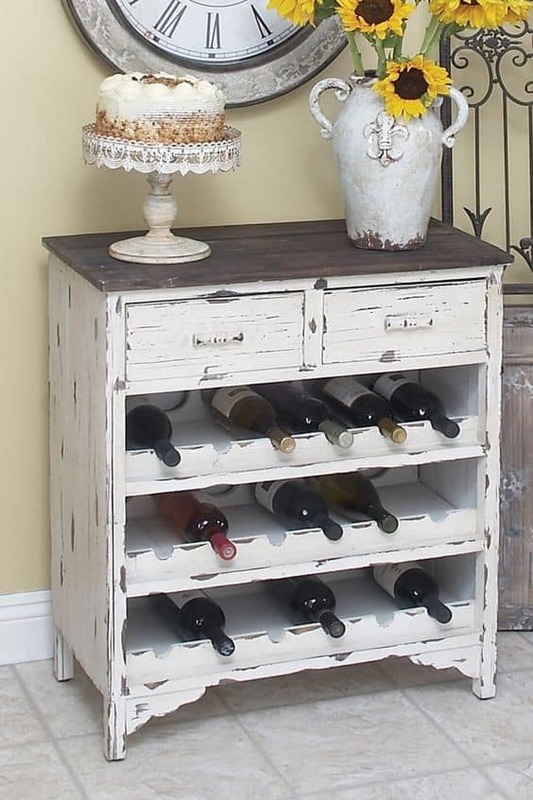 Old furniture is a great starting point for creating your own unique wine rack. 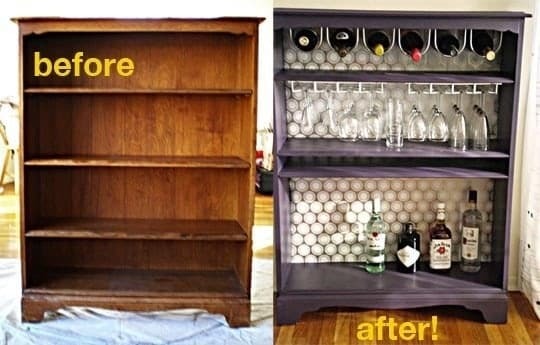 You can clean up and refurb an old cabinet, table, or even a piano into a wine rack. 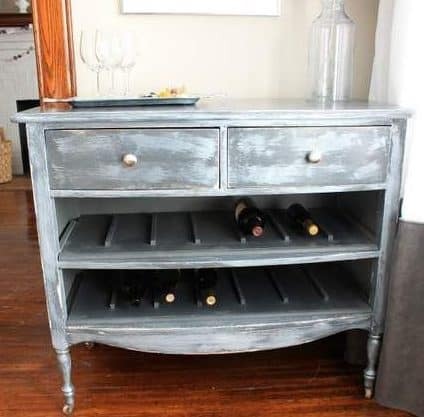 This is actually an old dresser found in a dumpster, that was cleverly converted into a wine rack storage table. They sanded it down and applied a walnut stained top and painted the entire piece white. Afterward they added new cabinet pulls, and wine bottle and wine glass holder hardware. And if you feel like going for a weathered vintage look, you don’t even have to refinish the cabinet as you see below. 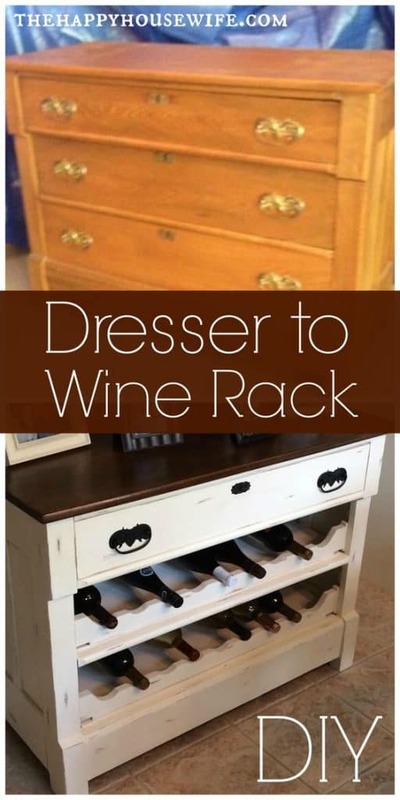 We also have a Dresser to Wine Rack DIY provided by The Happy Housewife, which she shows you how she took an old dresser and converted it into a wine rack. 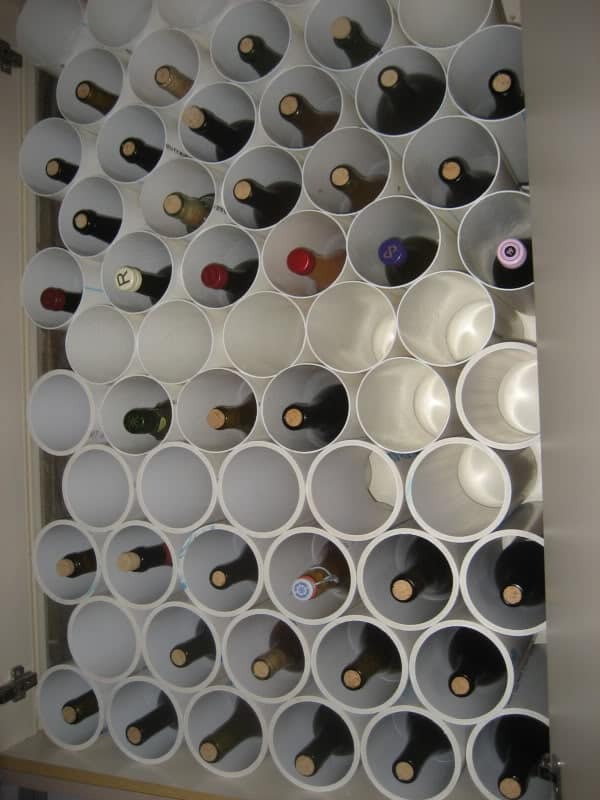 Similar to PVC pipes, you can make a wine rack out of old cans. Food cans, coffee cans, any kind of can that’s wide enough to hold a wine bottle. Here is a tutorial for build a canned wine rack. What could be more rustic than a wine barrel? A wine barrel is a great source of recycled wood. 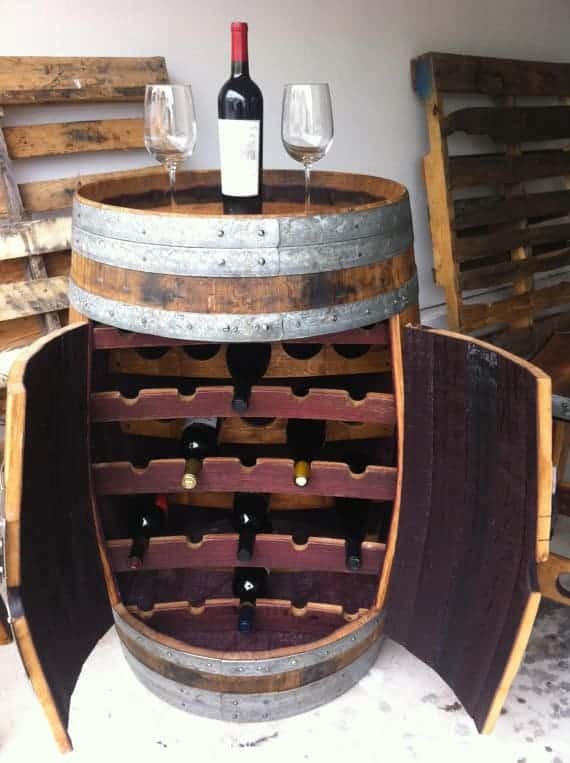 You can either open up a wine barrel or remove each plank that makes up a barrel to make your own wine rack. An actual barrel can be cut open and the cross-sectioned with a few extra planks of wood to create shelves where wine bottles will be stored. The other half of the barrel can become the rack’s door. Just put hinges on it, then re-attach it to the other half. Then it can open and close. The other kind of wine barrel wine rack is a “Stave” wine rack. A stave is just one of the rungs that makes up a barrel. You Take 2 of them. Add some metal hardware connecting the two of them and repeat for as many bottles you want it to hold. Here is a super great tutorial for creating one. over at DIY Pete’s. And if you don’t like Pete, here’s another one. When it comes to a rustic wine rack, nothing could be more pleasing to the eye than a rack that seems to display wine in an unusual manner. Such are the likes of racks that hold wine bottles upside down or racks that hold bottles from the cap or along their slender necks. 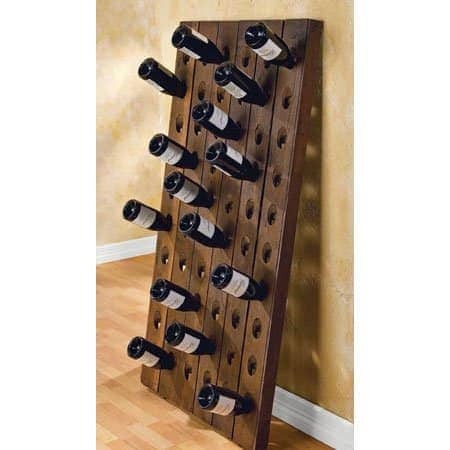 A beautiful rustic but modern wine rack. Are you looking for wine rack plans to build a new one for your collection? 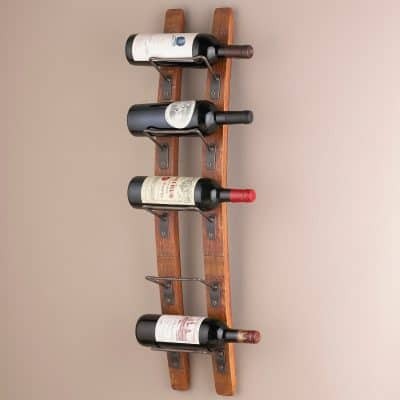 Someone new to wine collecting and wine appreciation is sure to ask where to find DIY plans to make wine racks. You need to use a suitable and efficient building plan to ensure that you are constructing a safe, stable and secure wine rack for your precious wine collection. If you are new to wine rack making, here are a few great sources. The DIY Network is the home of easy to use and fun DIY ideas. The wine rack section is bursting with great ideas for wine racks. 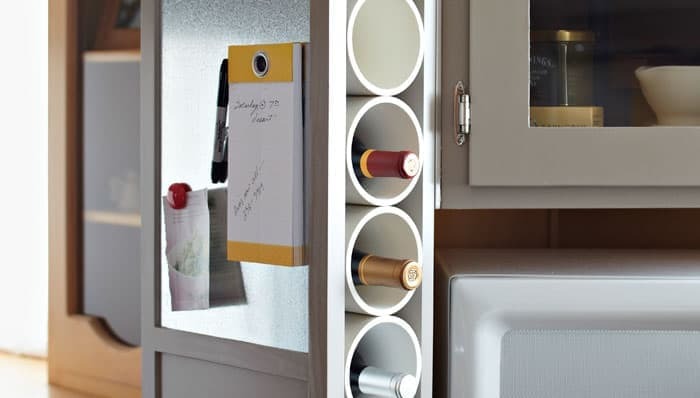 From easy wine holders to complicated wine cabinets or wine racks. Another great DIY site for wine racks is the Woodworkers Workshop where you can build wine racks that are made of beautiful wood. Wood is the material of choice for most wine enthusiasts because it’s easy to use, attractive and will work well for any size and style of wine bottles. There are more wine rack plans online but be sure to study the plans carefully to ensure that you are constructing a safe and secure rack for your collection. Follow plans carefully and take into account the strength of materials that you will use as well as the tools that you will need for your DIY project. 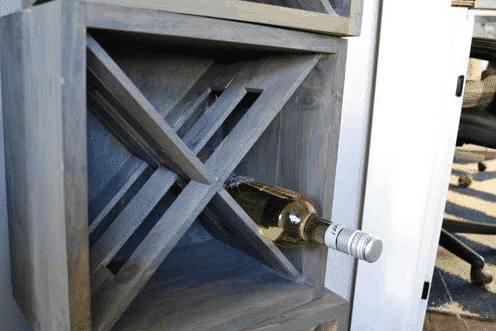 There are more stylish and definitely more intricate DIY wine rack ideas that need a longer period of time and more DIY skills. But no matter how large or how small or how simple or how complicated your DIY rack is, it is guaranteed that you will get the personal satisfaction of knowing that you have made your own wine rack all by yourself.